I know this is my crafting blog and I should try and stick with the theme but sometimes there is a story that just holds so much meaning that it must be shared. This is a story which has circulated around the web for quite some time now. Every time I read it I always get a tear in my eye. It's probably one of the most heart touching stories that really expresses how a small bit of kindness can change a person's life. Today's society and lifestyle it is very hard to forget to be kind to others. I admit that I even forget. I try my best though because I really believe in karma. Bad things done to another will always come back to bite you. It may not happen right away but eventually it will happen. A good deed done to another and the reward is reaped right at that moment in your heart and soul. Just remember treat others as you would like to be treated. Okay enough with my battering here's the story. Enjoy! 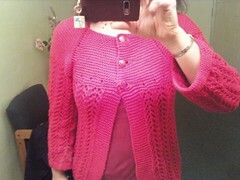 I finished this sweater almost 2 wks ago but didn't get a chance to blog about it. I used the same pattern that I made my daughter's in for mine. The pattern is just so easy yet the end result is so striking that I knew I had to have one for myself. I picked up this yarn from Yarn Paper Scissors (which sadly is soon to be closing their doors) on sale. The yarn is Cascade Sierra which is a cotton/wool blend. I LOVED working with this yarn. It was very soft to work with and I didn't have any problems with any splitting while working with it. I think because of the amount of cotton in the yarn this didn't make for a good yarn to block with. The sweater is extremely comfortable to wear and it's not too hot nor heavy. I think the lace pattern also helps this. There are two things which I am not overly pleased about. I wanted long sleeves (as in all the way down to my wrist). I thought that I had made the sleeves long enough but I didn't account for when my arm bends that the length goes up. So now I'm debating to rip out the garter stitch rib and making the sleeves longer. I think since I did each sleeve in two separate sittings that I was just antsy to get it finished. Each sleeve had 23 repeats of the lace pattern. The other issue is the collar. I found instructions on ravelry on how to incorporate a collar so I may just try it out and see how it turns out. Overall I'm still really happy about this sweater and i"m pretty darned proud of it. As those with children probably know the camera is constantly going off capturing those one of a kind moments. Personally I have thousands of these pictures since I have two daughters. I've been debating for many years how I should do scrapbooks? Should I do one for each child and have another one to scrapbook family things? I'd love to hear suggestions and comments about how I should scrapbook these memories. I wanted to try to make something crafty and cute for my mother in law for Mother's Day. It took me a couple of days to figure out what to make. I decided on making her an altered tin. My sister in law had got me a bunch of different tins for a present a year or so ago so all I needed to do was decorate it. I first started with origami paper. I lined the entire outside body with blue floral origami paper. I then used this adorable Japanese girl in a kimono stamp and stamped her 10 times. I colored half of them red and the other half. I used little rhinestones to put in the middle of her stash in red and clear. 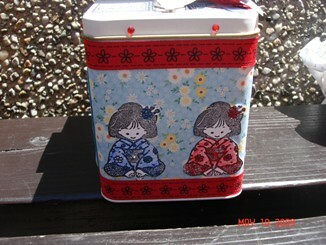 The front of the altered tin has a little Japanese boy and girl sitting. I stamped them and colored them. They are attached with a foam 3d dot. 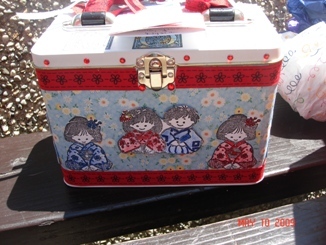 The top and bottom of the tin are outlined with an adorable red ribbon. 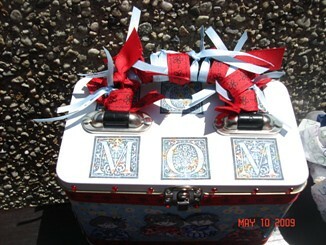 The handle has the same red ribbon as the outline of the box along with light blue ribbon. There was a small dilemma of how I was going to decorate the top of the tin. I didn't want to try and cut out the origami paper to make it fit on the top so I ended up taking the same color origami paper and using CTMH stamp set Baroque and stamped out "MOM". To also add a little bit more to the top I took the same red rhinestones and attached them to the sides of the top. To make it personalized and signify that this was a mother's day gift I took pictures of her (adult) children and attached them to the inside lid. I then took some chipboard designs that I had that were appropriate for the occasion and attached those. Overall I was very with the result and so was my mother in law. 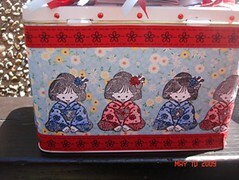 I loved creating this tin and for me it shows that i can be creative when the mood strikes. I've noticed that I use this blog to mainly post my finished projects. I know that people love to look at pretty pictures but people also like to come to blogs to read about other things related to their blog's focus. So I've decided to try and incorporate other things in this blog. I live in an area where there is a nice vast selection of yarn shops. Sadly, though due to the economy, there have been a few closures of lys (local yarn stores). Thankfully there are still plenty to choose from. This little yarn store is within walking distance from my house. This store is yarn heaven. The owner, Kathryn, has such a mass amount of yarn in her shop that one can spend so much time in here. Since there is so much yarn, it does feel a bit overwhelming when you first walk in. Once you get a feel to how the store is set up it's all over. Cottage Yarns carries a vast amount of name brands that are extremely popular. Some yarn brands are Casacade, Lamb's Pride, Malabrigo, and the list goes on. Besides having such a wonderful selection, Kathryn is very helpful. I can't tell you how many times I've gone in and needed yarn suggestions for a product and she gladly helped me. This is probably one of the only yarn stores where I feel extremely comfortable. Prices are competitive for other local yarn stores. Some prices may be a bit higher here but the service makes up for a whatever difference. I'll gladly pay more for yarn if the customer service is there. I love this store and have no gripes about it. Highly recommend! The other local yarn store I'll be reviewing today is one I just discovered about a month or so ago. The yarn selection is wonderful. I believe this is the only local store which carries Blue Moon Fibers yarn. I've heard mixed reviews on this yarn and wanted to see it for myself. They also carry some other really nice yarns which I haven't seen anywhere locally. The other aspect I love about this store is the selection of circular needles and dpns. I've never seen so a store stock so many addi turbo needles! It was like walking into addi heaven. The prices were wonderful also! Probably the least expensive I've seen anywhere for addi needles. Overall I do enjoy this store. Yarn selection and price will make any knitting/crocheter eager to spend their moo-lah here. There are other yarn stores I've been to locally but I'll just do two for now. Would love to hear other's reviews of these stores.